Florence Bayard Hilles, of Newcastle, Del., was the daughter of Thomas Bayard, American ambassador to Great Britain and secretary of state under President Grover Cleveland. She became involved in the suffrage movement after hearing Mabel Vernon speak. She realized that Vernon was saying what she believed in – yet she was doing nothing about it. They quickly became good friends. Hilles gave her time, her money and her car – the “Votes for Women Flyer” to the cause. 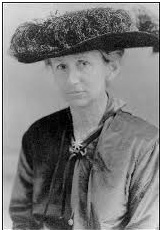 She was chairman of the Delaware Branch of the National Women’s Party and member of the national executive committee. One of the “Silent Sentinels” who picketed the White House, she was arrested on July 13, 1917, and sentenced to 60 days in Occoquan Workhouse. She was pardoned by President Wilson after serving three days of her term. The library at the Sewall-Belmont House, is named after her. Excerpts from Doris Stevens, Jailed for Freedom (New York: Boni and Liveright, 1920), 361. Portrait: 1916. Copied from original in the collection of the Jewish Historical Society of Delaware Archives, Sally Grinns Collection.